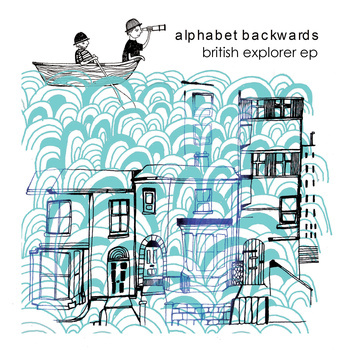 Recently released through Highline Records, 'British Explorer' is a new three track EP from Oxford's Alphabet Backwards. With apparent support from the likes of Huw Stephens, Tom Robinson, and Steve Lamacq, the band have been making steady inroads during 2011, with their simple mission statement being to 'champion the noble art of pop music, dancing all the way'. Opening track 'Big Top' brings up a clear comparison with Cardiff's Los Campesinos! with the dual combination of male and female vocals being a striking one, however some clever synths help to widen the gap between the bands' style, and Alphabet Backwards ear for a catchy melody is hard to ignore. 'Tonight' carries on in a similar vein, with an interesting mix up of acoustic guitars put against the synths, as well as a clear appreciation of space within the song, which helps to broaden the bands' appeal. The final track of this short record is 'Taller', which is also the leading single to be taken from it. An obvious choice too after hearing the opening few bars, as some frankly irresistible vocals from frontman James Hitchman are played out over yet more guitar/synth based pop music. I think what helps make Alphabet Backwards stand out over their pop loving piers is that they do keep things simple, not being afraid to let their music and lyrics stand up for themselves, as opposed to other acts who throw everything into it hoping something will stick.